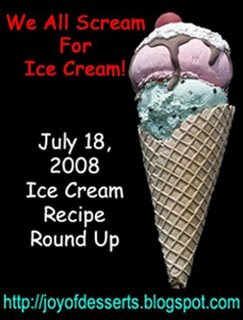 July 31st is Joy’s 2nd Annual Ice Cream Round Up over at Joy of Desserts so this week’s Tuesdays with Dorie choice by Lynne of Cafe LynnyLu of Vanilla Ice Cream on pages 428 and 429 was absolutely perfect timing for me! I have been waiting for and working on this round up all year!! Here are a few more ice cream recipes to tantalize you past the plainer but always yummy vanilla that we made today for Dorie. Don’t forget the basics I offered up here on making ice cream in general with a Basic Ice Cream Base. All my recipes make 1 quart unless otherwise specified. Gradually add sugar, whisking constantly until sugar is dissolved and well blended. Add cocoa, cinnamon and coffee, blending until well incorporated. Whisk in milk, cream and vanilla until well blended. Transfer to ice cream freezer and follow manufacturer’s instructions. Add chocolate chips and caramel sauce a few minutes before ice cream freezing is completed. Add chocolate chunks and cherry pieces a few minutes before freezing process is complete. Add Heath bar pieces a few minutes before ice cream is done. Add coffee, whisking until well incorporated. Add marshmallow pieces a few minutes before freezing process is complete. Fold in fudge sauce immediately after freezing process is complete. Add juice concentrate, whisking until well incorporated. Toss peach pieces with lemon juice. Add peach pieces a few minutes before freezing process is complete. In a large mixing bowl whisk the eggs until light and fluffy. Gradually add the sugar while whisking. When sugar is dissolved add the cream and milk until well blended. Divide in half and add peanut butter gradually to one half and then mix that mixture back into the other half. In a mixing bowl mash bananas really well and add lemon juice, blending well. Add banana mixture a few minutes before the ice cream is done. Add Reese’s chunks a few minutes before ice cream is done. Add banana mixture and strawberry chunks a few minutes before the ice cream is done. Juice the lemons. Include the pulp, but be sure to remove seeds. Add strawberry pieces and toss well. Chill for an hour. Whisk together the water, corn syrup, sugar and rum until sugar is well dissolved. Add lemon strawberry juice and zest, blending well. Transfer to the ice cream freezer and follow manufacturers directions. And let’s not forget the toppings! In a medium saucepan whisk together corn syrup, butter, sugar and salt until sugar is dissolved. Gradually bring to a low boil. Gradually stir in the cream and serve at once. July 31st is Joy’s Ice Cream Round Up over at Joy of Desserts so in preparation I am doing a bit of an ice cream review if you will covering the basics and a few yummy recipes too will soon follow. Ice cream at its most basic is sweetened, frozen cream and milk. The amount and type of butterfat used will determine the richness and creaminess of the ice cream. Adding eggs increases the creaminess. The butterfat chart ranges from using skim milk at less than 1/2% butterfat through low fat milk, whole milk, evaporated milk… to heavy cream at 36% butterfat. You can use sugar, maple syrup or honey to determine the sweetness. Each sweetener has its own specific flavor. The darker the syrup or honey the stronger the flavoring. Eggs or egg yolks are used as emulsifiers to bind the butterfat and tend to make a richer, creamier ice cream. This ice cream also stores longer. Many commercial companies use Polysorbate 80 in place of “real” eggs. Air is a hidden ingredient in ice cream and necessary to some extent to prevent ice cream from being a block of ice, but a little goes a long way and the less air the creamier the ice cream. One of the keys to a good ice cream is using COLD ingredients. All ice creams start out soft. It can become icy if allowed to ‘harden” too long. You always start with a sweet cream base and the flavor is then determined by the additives. Some of the basic flavorings such as vanilla or chocolate are added in the beginning of the freezing process while your ‘chunkier’ additives (chocolate chips, bits of heath bar, fruit pieces, etc…) are added towards the end, but before the freezing process is completed. Salt is added in very small amounts to enhance flavors by many, but is a personal preference. If you are using liqueurs in your ice cream the freezing time will be extended and always be a soft ice cream. Less is more when it comes to adding liqueurs. If you add to much, it will never freeze. When using fruits, use a HIGH butterfat sweet cream base to counteract the additional moisture found in fruits. Also when using fruits chop them and toss them with a bit of sugar several hours or a day or so in advance, keeping them totally COLD. TUNE IN THIS WEEK AS I POST MORE ICE CREAM RECIPES. Hubby really looking forward to being a taste tester over the next couple weeks! Join Joy at Joy for Desserts for the 2nd Annual We All Scream For Ice Cream Roundup on Friday, July 31, 2009, with all your favorite frozen recipes! Ice cream, sherbet, parfait, ice milk, Sundaes … if it’s frozen treats, let’s roundup all those scrumptious recipes. Then have fun reading everyone’s lovely recipes for the 2nd Annual We All Scream For Ice Cream Roundup. 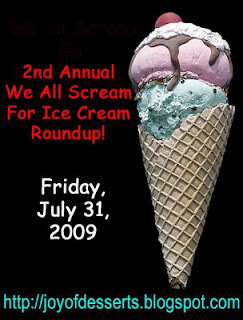 Help me spread the word so we can all get lots of recipes and lots of visitors by adding the graphic to your sidebars and by writing posts about this 2nd Annual We All Scream For Ice Cream Roundup. your ice cream recipes and see everyone else’s recipes!!! While I have your attention and we are on the topic of Round-Ups, if you find yourself with the Need to Knead, we have the bread round-up for you. Joy and I will be co-hosting this event. Start scouring the nooks and crannys for all those bread recipes. 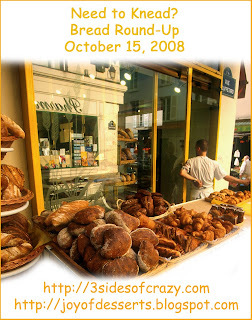 We will round-up all types of bread recipes on October 15th. We hope you will participate! Juice lemons until you have 3/4 cup of juice. Zest lemon peels until you have 2 tablespoons. Be sure to zest only the bright yellow as the insides are more bitter. In a small saucepan, heat the milk over a medium heat until it begins to bubble. In a larger saucepan whisk the sugar, salt and lemon peel into the egg yolks. until well blended. Gradually whisk in the warmed milk mixture. Cook and stir continuously with a wooden spoon over medium heat until mixture thickens (about 15 minutes). Transfer to a large bowl and immediately cool the custard mixture by placing the bowl in a larger bowl of ice water for 5 minutes or so. Stir constantly while it is cooling. Freeze according the manufacturers directions. Combine sugar, cornstarch and salt in a large saucepan. Stir in the water and lemon juice until all dissolved. Add blueberries and cook over medium heat until bubbly and starts to thicken. Cook a few minutes more until desired thickness. Transfer to a pitcher and bring to room temperature before serving. Ice Cream Recipes in honor of National Ice Cream Month! we all scream for ice scream! Joy over at Joy of Desserts is hosting this delightful round up of recipes for ice creams, gelatos, sorbets, sherberts, granites, frozen yogurts and any ice cream-like confections. 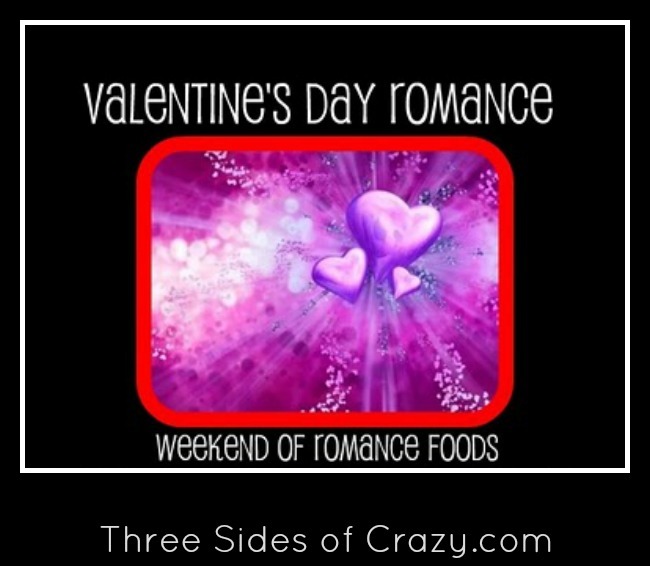 So click on over and check out all the recipes. If you want to join in head on over to Joy’s blog to link to it so that we may all visit you. You can even link to recipes you have already posted. Add this button to your participating posts and link to this blog. Your blog can be in any language, but a translator on your site will help any who don’t speak the same language. 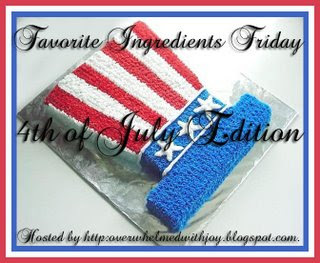 It just happens to coincide with Meredith’s themes for blueberries and National Ice Cream Month over at Scrumptious Sunday which is hosted by Meredith at Mercedes Rocks and with Favorite Ingredient Friday’s 4th of July theme which is hosted by Kathryn at Overwhelmed with Joy. It is not a problem with my ice cream freezer, but Kathryn over at Overwhelmed with Joy recently pointed out that she found it better to cool the mixture in the refrigerator before using the ice cream freezer. Warm the milk in a small pan. Whisk the eggs with the sugar in a separate bowl. Slowly add the warm milk to the egg mixture while continuously whisking the mixture. Pour the entire mixture back into the pan and heat slowly, stirring continuously until mixture thickens to loose pudding texture. DO NOT BOIL! Let it cool to room temperature. Whisk in the cream and vanilla. Follow your ice cream maker directions for freezing. Warm the milk in a small pan. Whisk the eggs with the sugar in a separate bowl. Slowly add the warm milk to the egg mixture while continuously whisking the mixture. Pour the entire mixture back into the pan and heat slowly, stirring continuously until mixture thickens to loose pudding texture. DO NOT BOIL! Let it cool to room temperature. Whisk in the cream and vanilla. Follow your ice cream maker directions for freezing. Add the strawberry chunks just before the freezing process is complete. Warm the milk in a small pan. Whisk the eggs with the sugar in a separate bowl. Slowly add the warm milk to the egg mixture while continuously whisking the mixture. Pour the entire mixture back into the pan and heat slowly, stirring continuously until mixture thickens to loose pudding texture. DO NOT BOIL! Whisk in the cocoa just before removing from heat. Let it cool to room temperature. Whisk in the cream and vanilla. Follow your ice cream maker directions for freezing. Add the chocolate chips just before freezing process is complete. Warm the milk in a small pan. Whisk the eggs with the sugar in a separate bowl. Slowly add the warm milk to the egg mixture while continuously whisking the mixture. Pour the entire mixture back into the pan and heat slowly, stirring continuously until mixture thickens to loose pudding texture. DO NOT BOIL! Whisk in the cocoa. Let it cool to room temperature. Puree’ the bananas and whisk into the cream and vanilla. When cooked mixtures cools, whisk the two together. Follow your ice cream maker directions for freezing. Add the chocolate chips just before freezing process is complete. Warm the milk in a small pan. Whisk the eggs with the sugar in a separate bowl. Slowly add the warm milk to the egg mixture while continuously whisking the mixture. Pour the entire mixture back into the pan and heat slowly, stirring continuously until mixture thickens to loose pudding texture. DO NOT BOIL! Let it cool to room temperature. Whisk in the cream and vanilla. Follow your ice cream maker directions for freezing. Add the jam just before freezing process is complete. Pour the rum over the blueberries. Let stand overnight. Warm the milk in a small pan. Whisk the eggs with the sugar in a separate bowl. Slowly add the warm milk to the egg mixture while continuously whisking the mixture. Pour the entire mixture back into the pan and heat slowly, stirring continuously until mixture thickens to loose pudding texture. DO NOT BOIL! Let it cool to room temperature. Whisk in the cream and vanilla. Follow your ice cream maker directions for freezing. Drain the excess moisture off the blueberries. Add them just before the freezing process is complete.